I was excited about this book but also a bit scared because I had read mixed reviews. But in the end it was really great and I can’t wait to read more about this world and its characters. I am all about superheroes these days, after reading Vicious and watching The Incredibles last week! The book was fast-paced, fun and entertaining. I loved the duality between the good guys and the bad guys, which is not at all what it seems, the villains not really being villains and the heroes who are not really what they seem. Nova is a really great character and her relationships with the Renegades is interesting and complex. 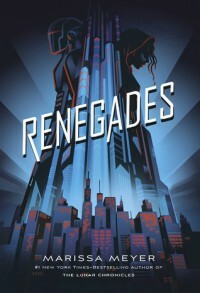 I really love the fact that she understands the Renegades are not all bad and the Anarchists are not all good either. We have both perspectives and it was nice. I really would have liked to learn more about new abilities, some of them were really intriguing and I needed more! Anyway, I can’t wait to read what is next.